The past few weeks have been filled with a mixture of farm visits, teaching and learning opportunities, exchanges, and hands-on opportunities; I (Maggie) cannot believe that it is already mid-July and that we have only 3 weeks left! Last week was somewhat of a milestone, as we finished up the welfare project we had been working on since arriving, and started on the second part of Shauna’s PhD, which focuses on nutrition. 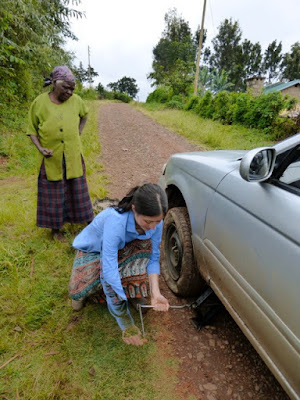 It was also Sarifa’s turn to head on exchange to Naari, so last Monday, after a full day of stall constructions, pregnancy checking, and deworming cattle, she set off with our other driver, Jeremiah. Jeremiah is a local taxi driver in the area, who has been working with Shauna for the past 3 years. He has been a great help to us when we need a second vehicle, and also a great addition to our construction team (one of my favourite lines of his has been “the Nail Man has arrived” – in reference to our abysmal skills with a nail and hammer, and his superior ability to get the job done much more efficiently and accurately). One of the last farms of the welfare project that we visited. 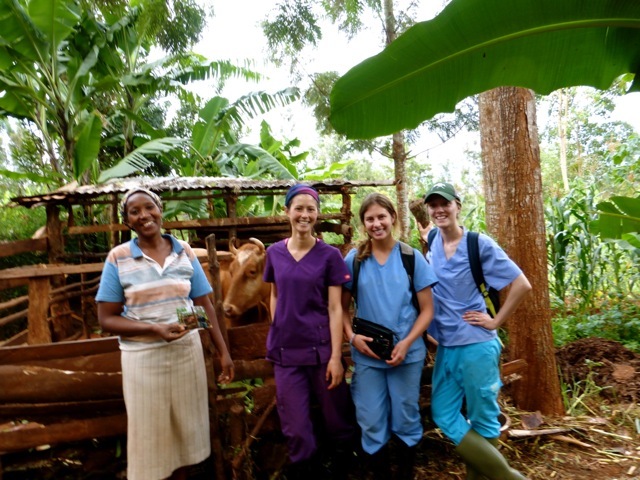 The farmer is holding a photo of her and Anika, one of the student interns from last summer! Last Wednesday, Mira and I had our first teaching experience at a local primary school. The school was Ithanji, the one we had visited in June. It is a fairly small school, and we had planned on teaching classes (equivalent to Canadian “Grades”) 6,7, and 8. However, when we arrived, the room was quite full, and some of the children looked younger than we were expecting…we found out afterwards, that all the classes except one were there! Considering how many students and what a wide range of ages were present, it was really incredible how attentive, well behaved, and engaged the students were. We had spent a lot of time creating a lesson plan that followed their curriculum, but also emphasized things that we feel are very important to human and animal health. In the end, this plan included material on “One Health” (how the health of the environment, animals, and people are all connected and can affect each other), how to recognize signs of disease in animals, how to prevent the spread of diseases, and then some more specific information on the zoonoses (diseases that can be spread from animals to humans) rabies, brucellosis, and diarrheal diseases. Overall, we felt that the whole experience was a great success, and the feedback we received from the teachers was extremely positive; they even requested to keep the teaching aids we had made. It was also nice to hear teachers and students discussing how they would share all the information they had learned with friends and family at home. For me though, the most rewarding part of the day was walking outside afterwards and seeing a group of girls practicing the handwashing technique we had taught them (at the hand washing station built by Farmer’s Helping Farmers!). 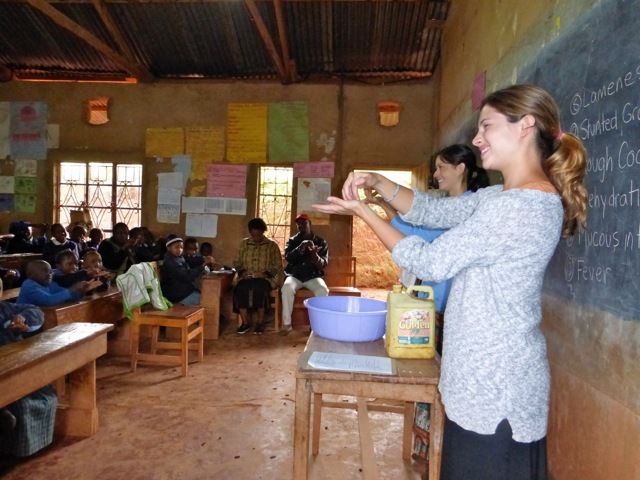 Maggie and Mira teaching students and teachers at Ithanji Primary School proper handwashing techniques. 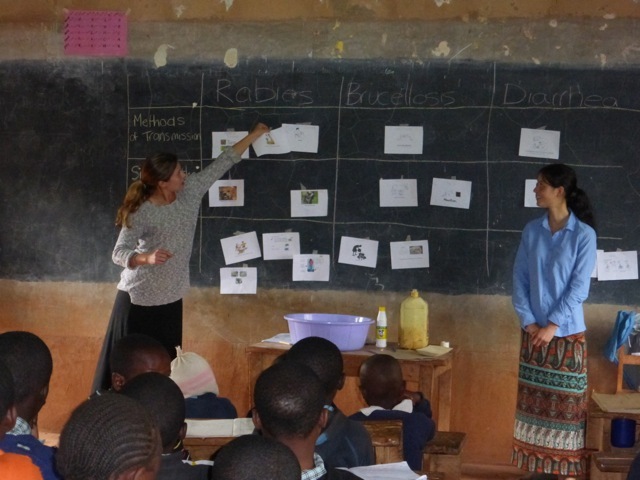 Going over the review activity that the students at Ithanji Primary School completed on zoonotic diseases. On Wednesday, we also visited the last farm of the welfare project, thus ending our construction marathon! That same day, Mira and I also had some practice changing a flat tire, so it seems we will be going home with a range of new handy skills! Learning to change a flat tire! 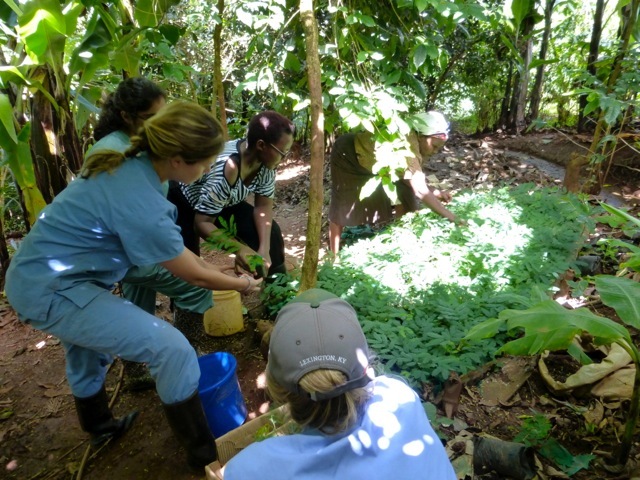 The next day, we started visiting farms that have been part of a nutrition project that Shauna started in 2013. This project has looked at the effects of different feeding methods such as feed types and amounts, and their effects on growth of calves, and reproduction and milk production of cows. 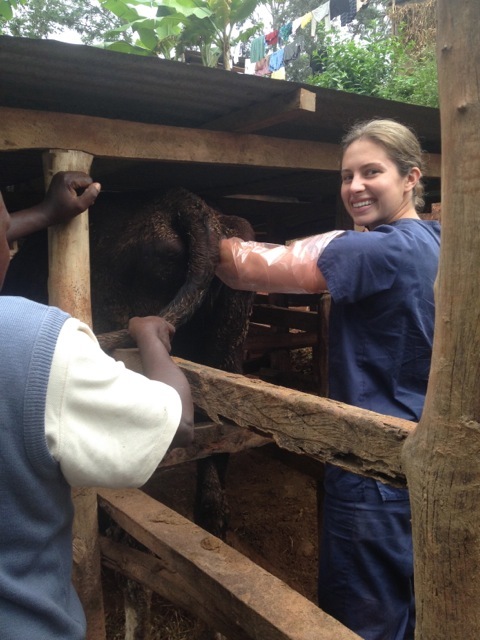 This year we are doing physical exams on the cows and any of their calves (now 2 year old animals) that are still present on the farm, while Shauna gathers more information about their health and reproduction. The study has found some really interesting results and it is nice to be able to give some feedback to the farmers on practical and economical ways that they can feed their animals in order to maximize profits for themselves and the animals’ health. That same day, we also visited a farm that one of the local veterinary technicians put us in contact with. This farmer had a cow that had clinical mastitis and he was drying her off (stopping milking to give her a rest before her next calf due in September). Mastitis treatment is generally done via intramammary infusions, where an antibiotic is put into the affected teat(s). Since this cow had not responded to previous treatments we decided to give her a different dry cow treatment. Dry cow treatment is often more effective because the type of antibiotics used are able to stay in the udder for a longer period of time compared to when a cow is still being milked. This visit provided us (the students) with a great opportunity to practice giving intramammary infusions, and also discuss management practices that the farmer could use to reduce the risk of mastitis for his cows. On a side note, he also had the largest heifer that I had ever seen! Mira pregnancy checking an enormous heifer…it barely fit in the stall! Yesterday, we had another opportunity to do some teaching and also see some different farming styles. Kamau is an extension officer that used to work at the Mukurwe-ini Wakulima Dairy providing education and training to farmers. He is now working in a similar role but in a different part of Nyeri County, and had organized for us to meet some of his farmers and provide them with some training. 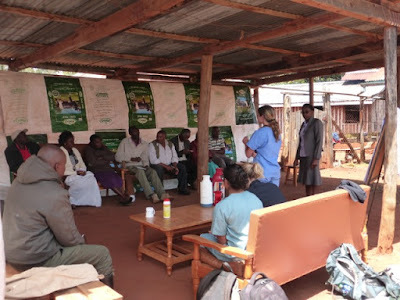 They were an extremely enthusiastic group that were very keen to learn, and the morning flew by as we discussed cow nutrition, mastitis prevention, and stall management with them. Mira teaching a group of farmers about the importance of having clean and dry stalls for their cows to lie in. We then spent the afternoon visiting many of their farms, which was very valuable as they are quite different to the ones we have been visiting around Mukurwe-ini. Like in Naari, most of their cattle are grazed at least part of the time, which means that they must also be sprayed for ticks on a weekly basis. Some of the farmers are also growing a variety of high-protein plants that are great (and economical) replacements for the more expensive dairy meal that people feed their cattle. One farmer actually had hundreds of Calliandra trees, which are the seedlings that we were giving to participants in the welfare project. It was really cool to be able to see what tiny seedlings can grow to in just a few years! As it turns out the farmer was unaware of what a good protein source Calliandra is until we had mentioned it during the nutrition part of the talk that morning, so he was very excited to learn about the ‘dairy meal’ that he had growing on his farm already! Picking up Calliandra seedlings to give to farmers in the Welfare project. 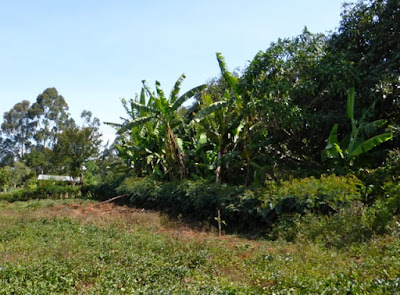 A row of Calliandra trees on a farmer’s property that we visited with Kamau. A 22 year-old cow (on the left)! This is one farm we visited that had a larger number (10) of cows. Some of the farmers also had many more cows than we are used to seeing, and it was very interesting to see how they manage these larger numbers. 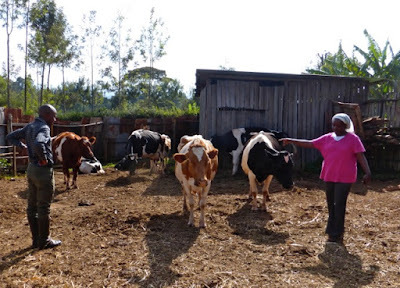 A common problem farmers face in Kenya is feed shortages during the dry season, and this can be especially difficult when there are more mouths to feed. Recently, there has been a growing interest in making silage, which is fermented, storable feed, to help with this problem. 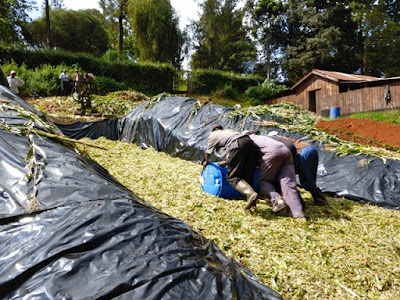 Kamau has done a great job working with his farmers to teach them about this, and one of the larger farms we visited had just built brand new silos to start making and storing silage in. Coincidentally, as I am writing this blog, the farm where we are living on is actually in the process of making its first batch of silage. This farm also has a large number of cattle (~20), so this is an exciting step to ensuring there will be forage available for the animals, even when crops aren’t growing well during the dry seasons. Making maize silage. The barrel of water is being used to compress the maize to get the air out. Finally, I cannot forget to mention our newest Kenyan friend. Last week, a kitten was found orphaned outside the Mukurwe-ini Wakulima Dairy, and after being unclaimed by her mother for over a day, we decided to feed her. 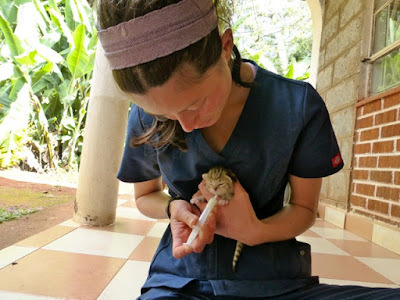 While it is difficult to guarantee the long-term health of such a young kitten, Maziwa (“milk” in Swahili) has proven herself to be an extremely resilient, voracious, and of course, adorable little furball.